One of the best instructors I've ever seen! Over time, computers become slow and unusable usually because they've accumulated too much excess junk. I can teach you how to quickly and easily find and remove this clutter using a series of tips and freely available tools. No matter how careful you are, eventually you'll get attacked online. I will help you install and configure your anti-virus and firewall so that any such attacks will be stopped in their tracks. When searching the Internet, you should follow best practices. Which sites should you click on; which should you avoid? How do you know the difference? Can you spot a fake website? Do you know if the company you're about to buy something from is ok to deal with? I can help you learn. If you want to store important information on your computer, you need to properly protect it. It's far too easy to lose your computer or have it fall to hackers who can take your unprotected data and use it for anything they wish. I will show you how to use free tools to protect your information so that it can't be easily taken and turned against you. You likely already know how important backups are; especially if you've lost data in the past. But that doesn't mean you have the time or knowhow to fix the problem. Let me show you how to simplify your data storage and backup process and greatly reduce your risk of permanent data loss. Ever sign up for Facebook, Twitter, or any other online service? Doing so without caution can lead to embarrassment and/or breaches of your privacy and security. 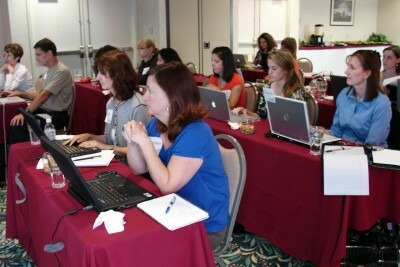 I can teach your attendees the best practices for using online services safely. This workshop is intended to improve your computing experience permanently so it is is BOYC: Bring your own computer. Preferably the one you use and work on every day. While many of the tools described are PC only, Linux or Mac users will still be able to utilize the techniques and methodologies described. Let's face it; you can scream till you're blue in the face. You might read everything here (or know it already) and try to share it with others. "Read this site", you say. "Be safer and smarter", you say. It won't work and we both know it. Human nature has a way of making you ignore people you know and favor information from complete strangers. That's where I come in. I will come and teach your people in a few hours tips, tricks, and rules; maybe even the same ones you've always taught them. But this time they'll hear it. I use humor and relevant examples to present information that has impact! After attending my seminars, expect your people to have a different view of safety and security and to be armed with the mentality and tools that will keep your people safe, your information secure, and lessen your chances of being the next news scandal. Protecting your assets (physical and virtual) means keeping out intruders. This is done with passwords, biometrics, badges, access cards, etc (but mostly passwords). But when your people don't understand the basics of protecting these authentication methods, your adversaries can easily exploit them. For the first time, your people will learn not only why it's important to protect their passwords, but how easy it is to do so. Also included is some discussion of alternate authentication methods; what works, what doesn't, and risk mitigation strategies. Most of Internet safety is just a matter of adjusting the way you think about things along with a little background on how the Internet actually works. Whether it's keeping employees from accidentally downloading a virus or teaching them how to tell which e-mails and websites are fake, a lot of pain can be avoided with comparatively little instruction. This is designed for employers who's employees work with sensitive information (government, defense contracts, police, lawyers etc). Bad guys will be more motivated to get to you through your employees so make sure they aren't unprepared for the threat. This session will mostly cover home computing, social networking, and privacy skills. Also good for employers who just want to make it clear that they care about their employees on a personal level! Portable computing may add freedom and efficiency, but it also adds risk. I will show your employees the risks they face and give them concrete countermeasures to defend againt them. Be certain you give your employees the training they need and not just the devices. Find or monitor. Put the power of the Internet in your hands. This session is all about finding information. Do you want to screen new recruits? Do you want to know and manage your company's reputation online? Do you want to make sure your employees aren't posting too much work information online? Want to keep tabs on the competition? Or maybe you just want your employees to be able to efficiently find answers to problems online? No matter the need, efficient work comes from efficient use of the Internet as a fact-finding tool. This is a rapid-pace session pointing out the most common ways that businesses lose their personnel, proprietary, or secret data. This will show techniques for stealing information, but focus on practical tips and a defensive mentality that will help your employees avoid current and future data theft. Feel free to mix and match workshop topics and seminar topics to suit your needs! Students who are going to be heading out into the workforce are more marketable if they have strong Internet skills and lack embarrassing personal information or photos. This workshop is focused on giving potential hires a better mindset when it comes to the Internet making them more efficient and more hireable. Kept intentionally short out of respect for the time commitment needed, these workshops answer the question: how can I best improve my employees' handling of sensitive data in the least amount of time, with the least cost and effort? Additionally, communication is the key to business success. If your workforce struggles to express their experience or your leaders are failing to listen, Jeremy can help. "Fantastic course!!! It should absolutely be mandatory for all federal employees even if their job doesn't directly deal with the web. Great use of photos and multimedia video clips."